As one of the most popular social media and instant messaging apps, WhatsApp is useful because of its very many useful features. If you are a regular WhatsApp user, there first thing you will think about when you purchase the new iPhone Xs/Xr/Xs Max is how to get your WhatsApp data from old iPhone to the new one. Most people think that they can only do that by restoring backup to the device. The truth is, as this article will clearly show, there are several potentially effective ways to transfer WhatsApp to a new iPhone Xs/Xr/Xs Max. 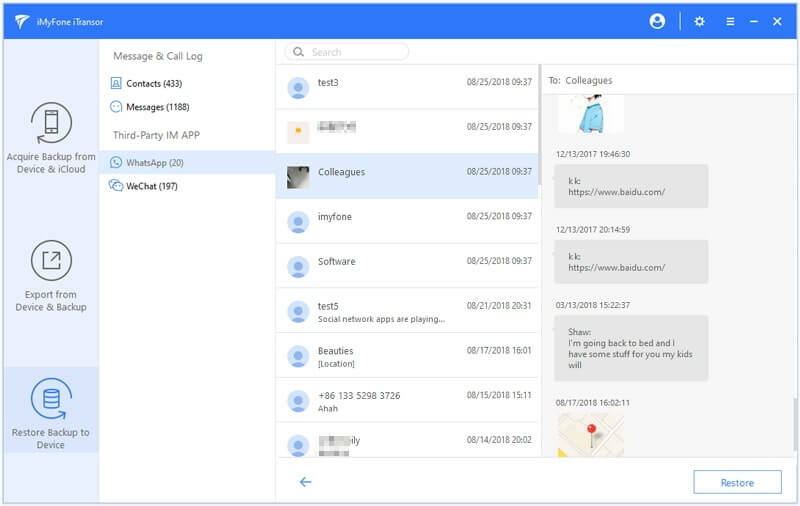 You can use it to back up just your contacts, SMS, WeChat or WhatsApp data for free. You can use iTransor to selectively restore data from your iTunes or iCloud backups without the risk of data loss on the targeted device. It can also help you view and extract up to 20 different types of data from your iCloud/iTunes backup or the iPhone. Then you can print or edit the files on your computer for more use. It supports all iPhone models and all versions of iOS including iOS 12 and the new iPhone Xs/Xr/Xs Max. 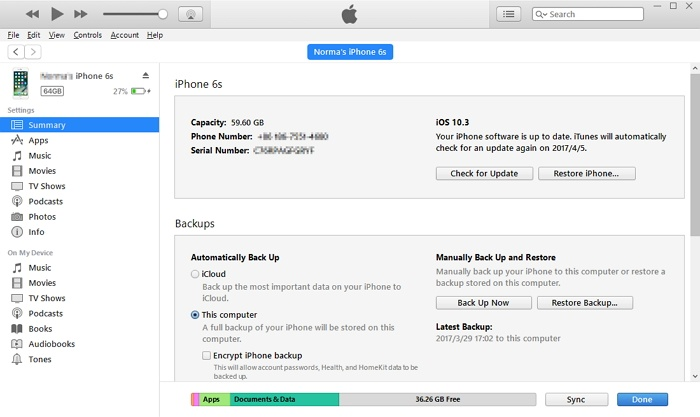 Step 1: Launch the program and on the main window, click on "Acquire Backup from Device & iCloud." Click on "Back Up Device." 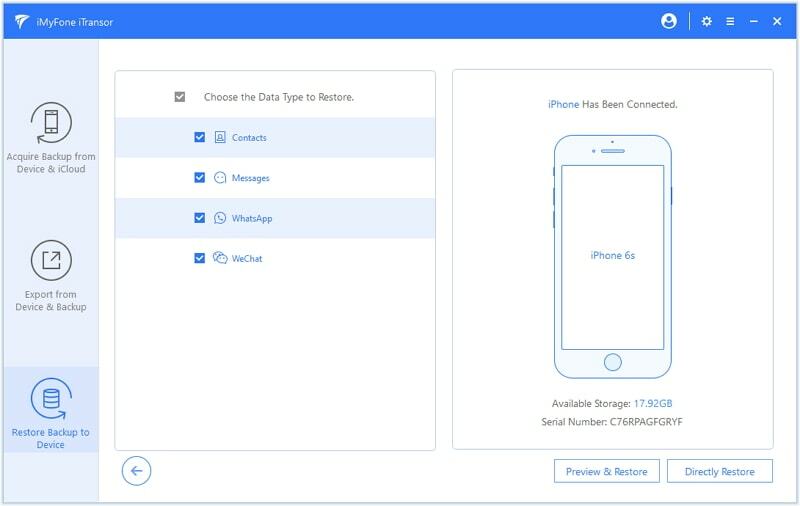 Step 2: Connect your device and, click on "Select One or More Data Types" and then make sure "WhatsApp" is selected. Step 3: Now click "Back Up" and the process will begin. 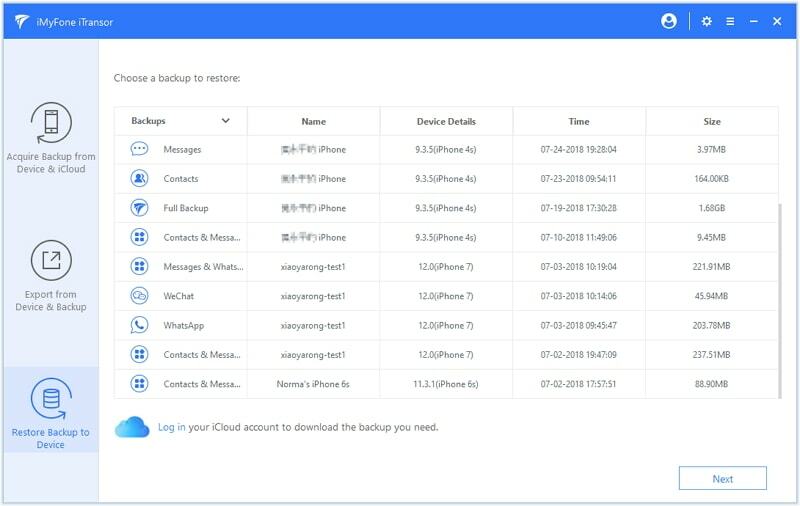 Now we restore this backup of WhatsApp to iPhone Xs/Xr/Xs Max. Follow these simple steps to do it. Step 1: On the main window, click on "Restore Backup to Device" and then choose the iMyFone backup created earlier. Click on "Next". Step 2: In the next window, choose "WhatsApp" as the type of data you want to restore and choose either "Preview & Restore" or "Directly Restore." 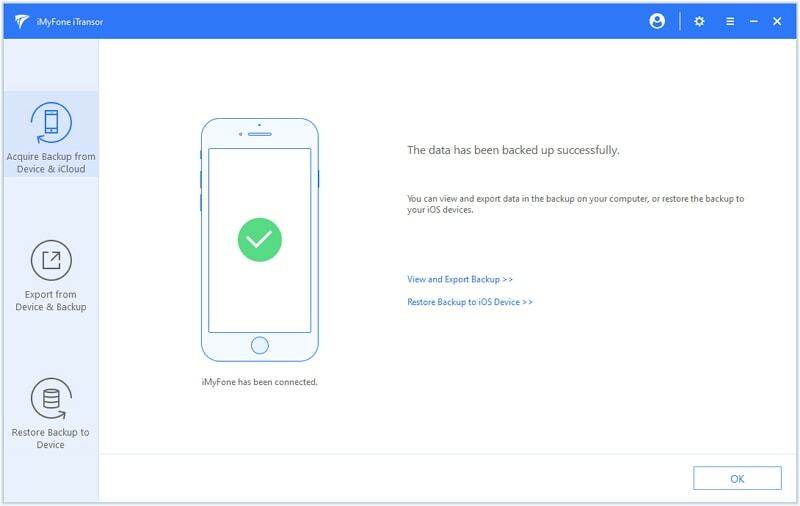 Step 3: If you choose Preview & Restore, you can preview the data the next screen to choose specific data you want to restore before clicking "Restore." 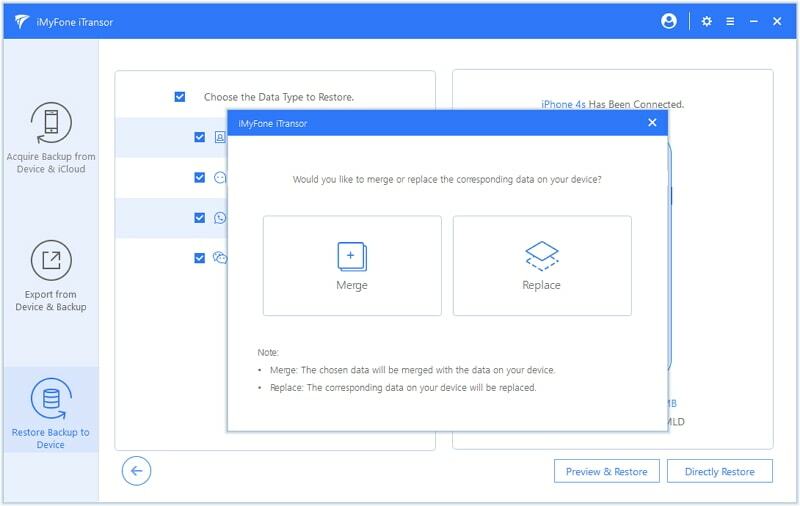 Step 4: in the popup window that appears, choose to "Merge" or "Replace" with existing data on the device. 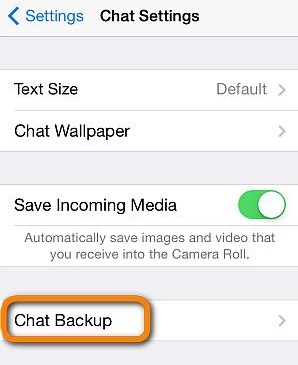 Step 1: in WhatsApp on old iPhone, go to Settings > Chats > Chat Backup > Back Up Now to make sure that you have a backup of the chats on the device. Step 2: if you have installed WhatsApp on your new iPhone Xs/Xr/Xs Max, you need to delete the WhatsApp application. You can do that by simply tapping and holding on the icon and tapping on the "X" that appears next to it. Step 3: Now install WhatsApp on the new iPhone from the App Store. Accept the terms and conditions to begin the installation process and then launch the Application. You may be prompted to allow push notifications while installing the device. 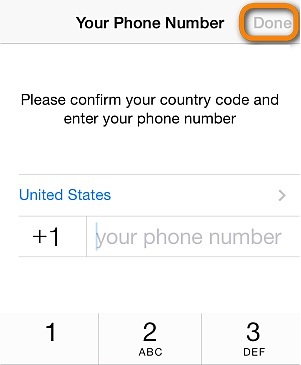 Step 4: Verify your phone number and other details to complete the installation process. 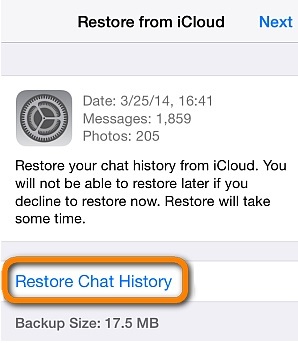 Once the app is fully installed on your device, click on "Restore chat history" to begin restoring the chat backup to the new device. All messages will be restored to their original location and you can now view the messages in WhatsApp on your new iPhone. You can only transfer WhatsApp textual messages only but not multi-media data like videos, audios and photos. You will also need to delete and reinstall the WhatsApp application which can be very inconvenient. Step 1: Connect the old iPhone to a Wi-Fi network and then go to Settings > Your Name > iCloud > iCloud Backup. 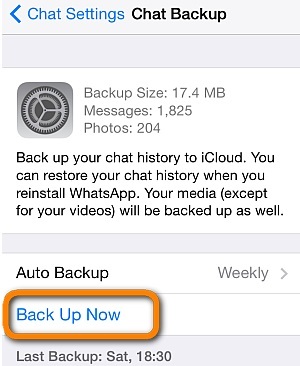 Ensure iCloud Backup is turned on and then click on "Back Up Now." Step 2: Keep the device connected to the Wi-Fi network until the backup process is complete. Step 1: Turn on the device to get to the "Hello Screen." If you had already set up the device, erase it from Settings > General > Reset > Erase All Content and Settings to get to this screen. Step 2: Join a Wi-Fi network and when you get to the "Apps & Data" screen, select "Restore from iCloud Backup." Step 3: Sign in to iCloud and choose a backup. Wait for the process to be completed. You cannot choose to transfer only WhatsApp data only but you have to backup and restore the entire device. There are also a lot of errors associated with restoring a device via iCloud. 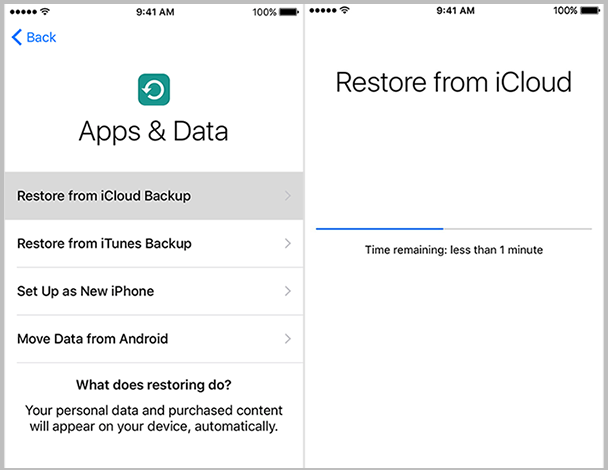 For example, iCloud backup restore stuck often during the process. 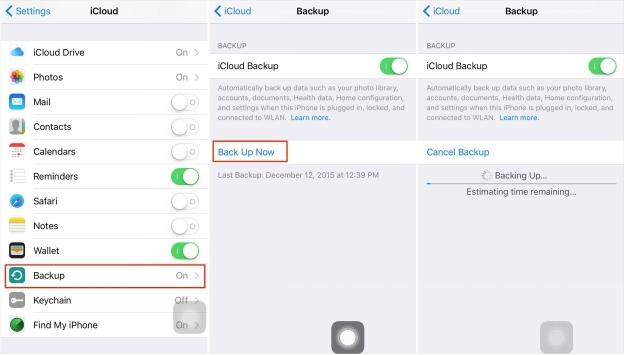 On the free account, iCloud users only get 5GB of storage which may not be enough to backup an old iPhone. Step 1: Connect the old iPhone to the computer and launch iTunes. You may also want to make sure that you are running the latest version of iTunes to avoid any errors during the process. 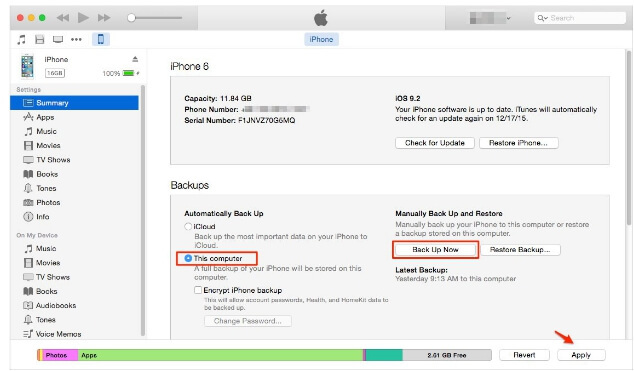 Step 2: When the device appears in iTunes, select the iPhone and click "Back up Now." Step 3: Turn on the new iPhone. You should see the "Hello" screen. You may need to erase the device if you have already set it up. To do that, go to Settings > General > Reset > Erase All Contents and Settings." Step 4: Follow the steps until you get to the Apps & Data Screen and choose "Restore from iTunes Backup." Step 5: Now connect the new device to iTunes. Select it when it appears in iTunes. Step 6: Choose "Restore Backup" and select the backup that we created earlier. Keep the device connected until the process is complete. You can't selectively transfer WhatsApp data only. You can only restore all the data to the device, or you get nothing from the iTunes backup. 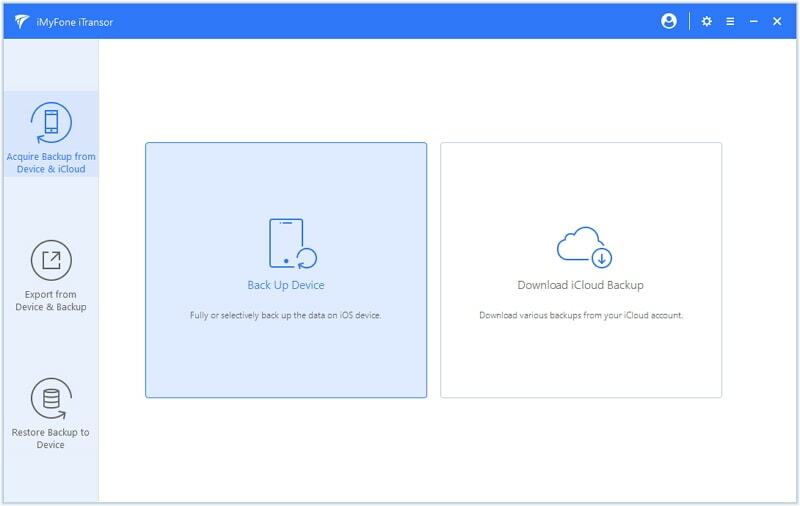 You may also have to deal with too many iTunes backup and restore errors that could significantly increase the time it takes to complete the process. 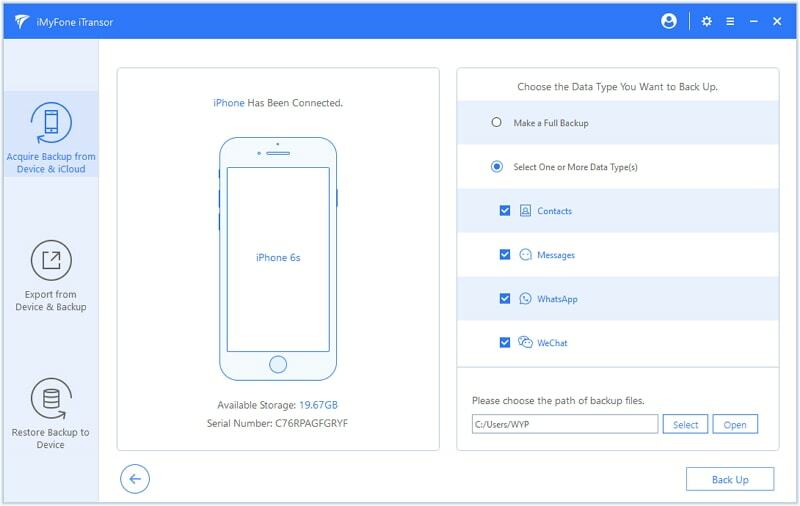 Now you have 4 ways to move all your WhatsApp data from an old iPhone to iPhone Xs/Xr/Xs Max. Let us know which method works best for you and why in the comments section below.